I really enjoy the artwork and comics of Charles Addams and Edward Gorey. 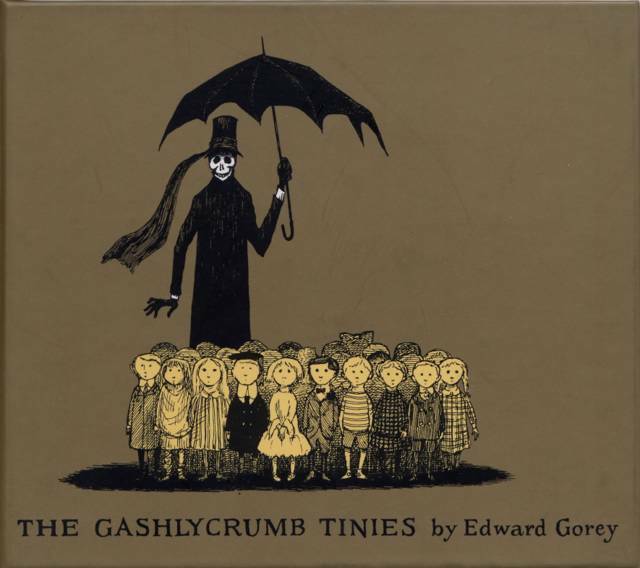 One of my favorite books by Edward Gorey is the ABC book: "The Gashlycrumb Tinies". In which which different children meet with disaster, or even an untimely demise. I love children - I have three children and two grandchildren - so, I can't explain why I think those are funny. I guess it is like slapstick humor - even though someone is getting hurt, there is something funny about the way it is presented and it is nothing like reality. If it seemed the least bit real, I wouldn't be amused by it. It is the extreme contrast from reality that makes it so funny - like the movers who struggle to get the beautiful grand piano up the long stair case and at the last minute drop it down to the sidewalk, smashing in a thousand pieces. Other then when I was a teenager, I've not done much macabre humor. However, several years ago after seeing before and after weight loss pictures, I was amused by the idea of extreme before and after pictures. 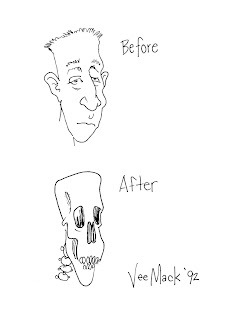 I was also amused by the idea of unusually shaped heads with matching skulls. The sketches posted here are the simple doodles that came out of those musings.